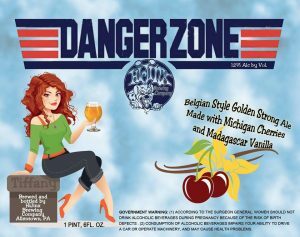 The crew over at Hijinx Brewing Company in Allentown are releasing Danger Zone, a Belgian-style golden strong ale infused with Michigan cherries and Madagascar vanilla this Saturday, August 5th starting at noon. Coming in at a heavy 12%, this brew is packaged in 750ml bottles. There’s only 175 available so if you want it make sure you’re heading up there this weekend. This release comes hot on the heels of their July 22nd release of their excellent Steal Your Face Stout aged in whiskey barrels from Bethlehem’s Social Still distillery.